Spiradiclis), above this developed into a free limb portion, this limb variously tubular to cupular or infrequently reduced to obsolete (Asperula, Coffea, Galium, Leptunis, Microphysa, Ophiorrhiza, Phuopsis, Rubia), truncate to 4- or 5(-9)-denticulate (i.e., lobes reduced to tiny projections along a generally truncate margin) or shallowly to deeply 4- or 5(-9)-lobed, open in bud or rarely with lobes markedly imbricate (Emmenopterys, Keenania), [or rarely spathaceous (i.e., fused into a conical cap that splits irregularly)], inside variously near base and/or at sinuses between lobes with few to numerous small colleters, rarely densely or markedly veined (Clarkella, Myrioneuron, Pseudopyxis), rarely on margins with well-developed, sessile to stalked glands (Mycetia), lobes generally triangular to linear, occasionally obtuse to lanceolate or oblanceolate, or rarely prolonged into a slender shaft bearing a thickened apical portion (Neonauclea), occasionally slightly to markedly unequal on an individual flower with all lobes of different lengths or infrequently in unequal pairs of similar lengths (Diodia, Mitracarpus, Spermacoce), infrequently with 1(to 5, Mussaenda) lobe on some (or all, Mussaenda) flowers of an inflorescence enlarged into a calycophyll (i.e., a membranous to papery, petaloid, veined, white to colored blade borne on a generally well-developed stipe; Emmenopterys, Morinda, Mussaenda, Schizomussaenda). Corolla large and often showy to reduced, gamopetalous, white, yellow, orange, red, blue, purple, and/or pale green, when nocturnal often white at anthesis becoming yellow with age, variously funnelform, salverform (i.e., hypocrateriform), tubular, campanulate, or occasionally rotate to infrequently urceolate (i.e., swollen in basal part of tube; Canthium, Lasianthus) or inflated (i.e., markedly swollen in middle or upper part of tube; Keenania, Leptomischus), infrequently curved in tube and/or gibbous (i.e., asymmetrically swollen at very base of tube; Chassalia, Guettarda, Mycetia, Ophiorrhiza), infrequently differing in shape between long-styled and short-styled forms (Antirhea), infrequently markedly fleshy to leathery (Caelospermum, Damnacanthus, Fosbergia, Rothmannia, Timonius, Urophyllum), inside glabrous to variously pubescent with pubescence frequently confined to throat, outside infrequently ridged to winged (Cinchona, Ophiorrhiza), rarely fenestrate in tube (i.e., with longitudinal slits; Damnacanthus, Paederia), lobes (3 or)4 or 5(-11), shorter than or occasionally longer than tube, acute or less often obtuse to rounded at apex, generally spreading to somewhat reflexed at anthesis, infrequently with margins crisped to irregular, densely ciliate, and/or appendaged (Cinchona, Luculia, Rondeletia, Saprosma, Serissa), in bud imbricate (and usually quincuncial), valvate, valvate-induplicate, valvate-reduplicate, or convolute (i.e., contorted) to left or rarely to right (Coptosapelta, Rothmannia), usually with aestivation consistent within a genus, occasionally with wings, ridges, and/or rounded to hornlike thickenings or protuberances on back or at apex (Lerchea, Ophiorrhiza), rarely cucullate (Lerchea). Stamens adnate to corolla, free or rarely fused to stigma (Acranthera), alternate to corolla lobes and isomerous (i.e., equal in number to lobes) or rarely more numerous (Gardenia) [to rarely fewer], inserted variously in corolla throat, tube, or infrequently at base and sometimes appearing free (Galium), included to exserted, with point of insertion and position of anthers usually differing between long-styled and short-styled forms of distylous flowers, with staminodes of pistillate flowers generally similar to stamens but smaller; filaments well developed to reduced or obsolete, free or rarely coherent (Argostemma) or fused (Acranthera, Argostemma), variously glabrous to pubescent, occasionally markedly flattened (Hymenodictyon, Kelloggia); anthers free or rarely coherent or fused (Argostemma), 4-thecal or rarely 2-thecal (Hymenodictyon), 2-celled, in outline generally narrowly oblong, linear (i.e., narrowly fusiform), narrowly lanceolate, or narrowly elliptic, at base occasionally bifid (i.e., sagittate; Caelospermum, Cephalanthus, Duperrea, Hamelia, Neohymenopogon, Scyphiphora), dorsifixed (i.e., medifixed to dorsifixed near base) to occasionally basifixed, infrequently pubescent (Hyptianthera, Lerchea), with dehiscence introrse by longitudinal slits or rarely by apical pores (Argostemma), with connective infrequently prolonged into an apical and/or sometimes basal appendage (Acranthera, Argostemma, Hyptianthera, Morinda, Rubovietnamia, Wendlandia), appendages rarely fused into a cone (Acranthera); pollen variously 3- or 4(or 5)-colpate and generally subglobose or occasionally 3- or 4-porate, 5-25-colpate and disk-shaped or ellipsoidal, in tetrahedral tetrads and 3- or 4-porate, cylindrical with 2 pores, or inaperturate. Ovary inferior [or rarely secondarily superior], sometimes fused between flowers (Mitchella, Morinda, Mouretia), (1 or)2(-10)-celled (i.e., locular), with ovules 1 or 2 to numerous in each cell (i.e., locule) on basal, axile (i.e., inserted on septum), apical, or infrequently parietal (Ceriscoides, Gardenia) placentas, in staminate flowers usually with ovary reduced and pistillode composed of structures similar to but smaller than style and stigma, in distylous flowers usually with ovary similarly developed but style and stigma differing in size and position in flower and sometimes stigmas also differing in shape between long-styled and short-styled forms; style 1, terminal on ovary, developed or rarely reduced (Galium, Microphysa), variously glabrous to pubescent, surrounded at base by well-developed fleshy disk [or this rarely reduced], this disk variously annular, conical, 2-parted, or shallowly lobed, glabrous or rarely pubescent (Clarkella, Mouretia, Timonius); stigmas free or rarely fused to anther connectives (Acranthera), 1- or 2(-10)-lobed (i.e., these lobes often equivalent to "stigmas 1 or 2 to 10" of some authors), with whole stigma or lobes variously capitate, linear, spatulate, clavate, lobed, or infrequently mitriform (i.e., shaped like a drinking glass) to cylindrical with recessed attachment (Canthium, Mitragyna, Pyrostria), glabrous or infrequently pubescent (Clarkella, Hyptianthera), variously included to exserted, with receptive surfaces introrse, apical, or internal. Infructescences generally similar to inflorescences but occasionally with part or all changing color, orientation, shape, and/or other characteristics as the fruit mature. Fruit simple or rarely multiple (i.e., a syncarp; Mitchella, Morinda, Nauclea), variously capsular with dehiscence loculicidal, septicidal, circumscissile (i.e., around equator or middle; Mitracarpus), or through an apical beak (i.e., prolonged disk portion, sometimes to give appearance of partially superior ovary; Hedyotis, Neanotis, Neohymenopogon, Ophiorrhiza, Pentas, Spiradiclis) or operculum (i.e., circular lid; Argostemma, Leptodermis, Leptomischus, Mouretia, Pseudopyxis); or fleshy, small to quite large, and baccate (i.e., with numerous seeds enclosed by fleshy to juicy pulp or endocarp and usually indehiscent); or drupaceous (i.e., with 1 to several seeds enclosed in pyrenes), fleshy to occasionally dry, and indehiscent or infrequently dehiscent releasing pyrenes (Paederia, Serissa); or schizocarpous (i.e., dry and separating into segments) with mericarps (i.e., segments, cocci, nutlets) indehiscent (e.g., Asperula, Cephalanthus, Richardia); calyx limb persistent or deciduous usually leaving a circular scar, sometimes with persistent carpophore or septum (Adina); pyrenes (i.e., seeds enclosed in and dispersing with endocarp layer) when present and ovules all developed 1-10-locular and 1-10-seeded (i.e., fruit containing several pyrenes and each pyrene with 1 seed in 1 locule, or pyrenes solitary in each fruit and comprising entire ovary), ellipsoid to subglobose, plano-convex (i.e., hemispherical), concavo-convex, lenticular, or angled (i.e., narrow with 2 large inner faces and a small outer face), with outer wall hard to cartilaginous (Caelospermum) or infrequently papery (Coffea, Pavetta), smooth to ridged or sulcate on dorsal (i.e., abaxial) surface, without (Psychotria) or usually with evident preformed germination slits, pores, and/or opercula generally on ventral (i.e., adaxial) surface, rarely winged (Paederia) or pubescent (Caelospermum, Paederia); seeds 1 to numerous, small (0.1-1.9 mm), medium-sized (2-5 mm) to large (5.1-20 mm), variously ellipsoid, lenticular, flattened, oblanceoloid, angled, or plano-convex, smooth to variously winged, foveolate, tuberculate, papillose, and/or striate; endosperm (i.e., albumen) fleshy, oily, corneous (i.e., horny) and entire or infrequently ruminate (Psychotria), or rarely absent (Antirhea); embryo variously shaped. x = 6-17, most commonly 11, less frequently 9 or 12. This is one of the largest families of flowering plants and is represented nearly worldwide though it is most abundant in the tropical regions of both hemispheres. Important economic members of the family are coffee (Coffea), quinine (Cinchona), madder (Rubia), ipecac (Carapichea Aublet), and various horticultural plants, notably Gardenia, Ixora, Mussaenda, and Pentas. Several genera include pantropical weeds, notably Mitracarpus, Richardia, and Spermacoce, of neotropical origin, and Oldenlandia (Hedyotis) of African origin. A number of species are used for various medicinal purposes. Genera, tribes, and subfamilies of Rubiaceae characteristically either have or lack raphides; this character is generally considered informative taxonomically in this family. Raphides are tiny, needle-shaped crystals that are produced in groups inside some cells of leaf, stem, flower, and fruit tissues. They apparently function to protect the plant from herbivores. Raphides are often visible with a hand lens on dried specimens, particularly in soft tissues such as petals, the calyx hypanthium, and the young leaves at the apex of the stem, but may be difficult to see especially in succulent plants. Leaf domatia are common in Rubiaceae and are sometimes taxonomically informative at least for separation of species. These domatia provide protection for tiny mites that live on the leaves and that help protect the plant from herbivores and fungi by eating insect eggs, small insects, and spores. These domatia occasionally take the form of foveolae or crypts, but more often are formed by small groups or tufts of pubescence, which is sometimes different in form from pubescence found on other parts of the plant. At least half of the species of Rubiaceae have distylous flowers: an individual species has two flower forms, the long-styled form (or pin) with the stigmas borne above the anthers and the short-styled form (or thrum) with the anthers borne above the stigmas. An individual plant bears only one flower form, and the flowers are incompatible with other flowers of similar form whether borne on the same or another plant. Heterostyly is unusual in the flowering plants and is found in several other plant families that mostly have three floral forms instead of two with the third form (the homostylous) with the stigmas and anthers borne at the same level. Tristyly has only been documented very rarely for Rubiaceae, although it was noted by FRPS for Chassalia curviflora in China. A number of species of many genera of Rubiaceae have calyx lobes that are unequal in size on an individual flower, and in some species of several genera one or more of the calyx lobes are markedly different, much enlarged and also often petaloid. These structures are found on flowers, where they are typically brightly colored and apparently function to attract pollinators, and/or on the fruit, where they are dry and brown and apparently function in dispersal of the fruit or seeds. These structures have variously been called "petaloid calyx lobes," a morphologically descriptive term; "semaphylls," a term that refers to the assumed function in pollination; and "calycophylls," the term used here that refers to the leaflike shape of the calyx lobe. These structures are sometimes mistaken for bracts; a few species of Rubiaceae do also have petaloid bracts (e.g., Dunnia), but those structures are inserted on the inflorescence axes or immediately below the ovary of the flower. The woody Rubiaceae are better represented (i.e., more diverse) in moist temperate regions of China than in comparable habitats in North America, as detailed by Latham and Ricklefs (in Ricklefs & Schluter, Spec. Diversity Ecol. Communities, 294-314. 1993). They concluded that this pattern, which is also found in a number of other dicotyledonous families, is due largely to historical factors. The principal factors they identified are the extinction of woody Rubiaceae in these other regions, while the plants were able to persist in E Asia (e.g., Emmenopterys), and the long-term direct connection of the moist temperate and moist tropical zones in E Asia vs. the separation of these zones by deserts and large water bodies in other regions. They agreed with Wolfe (in Nelson & Rosen, Vicariance Biogeogr. 413-427. 1981) that the connections of plant ranges between E North America and E Asia were broken by the end of the Eocene, and thus that species of the several genera that are found in both regions (e.g., Cephalanthus) have had separate evolutionary histories for some time. Several SE Asian Rubiaceae genera, all found in China, appear to represent the most basal living lineages of the family, notably Acranthera, Coptosapelta, and Luculia (Bremer et al., Syst. Biol. 48: 413-435. 1999; Bremer & Manen, Pl. Syst. Evol. 225: 43-72. 2000; Rydin et al., Pl. Syst. Evol. 278: 101-123. 2009). A number of species of Rubiaceae are cultivated as ornamentals; most of these are mentioned and some are keyed and described here. Additional information on many of the cultivated Rubiaceae was presented by Puff and Chamchumroon (Thai Forest Bull., Bot. 31: 75-94. 2003). Complete Rubiaceae floras for E Asia are very few. The Chinese Rubiaceae were treated comprehensively in 1999 by FRPS; the treatment here is based primarily on that work. The Fl. URSS was published in English in 2000, but this is an unedited, unmodified translation of the 1958 work. The Fl. Japan has been published in several editions but includes relatively few genera and is rather idiosyncratic. The genus overview within the Rubiaceae of Thailand: A Pictorial Guide to Indigenous and Cultivated Genera by Puff et al. (43-240. 2005) is a useful recent reference. Some morphological features that are characteristic of the Rubiaceae have been described, measured, and named very differently by different authors, and the differing terminology has generated some confusion. In particular, the terminology and measurements used for the calyx and gynoecium have differed widely. The ovary of Rubiaceae flowers is typically inferior, and the calyx is gamosepalous with its free portion, or limb, arising from the top of the ovary portion; this limb varies from reduced (i.e., not developed) to developed, and truncate to deeply lobed. Most Rubiaceae authors have distinguished the inferior ovary portion of the flower from the free calyx limb; the ovary portion has sometimes been called simply an ovary, but sometimes considered to include the fused calyx and corolla tissue covering it and called a hypanthium. However, several authors, including in FRPS, have treated as one structure the inferior ovary together with the unlobed lower portion of the calyx limb, when this is present, as the "calyx tube" and the lobed portion of the calyx as a separate structure, the calyx lobes. The "calyx tube" is often clearly delimited and measurable, but the inclusion of the ovary in this means that this measurement can sometimes include ovaries that have been fertilized and are developing into fruit, thus are larger than and not comparable to the ovaries at anthesis even though the corolla may be still attached to the flowers. Here the ovary or hypanthium portion of the flower is measured separately from the limb; the term "hypanthium" is used to link these measurements to those of FRPS. The limb is measured separately here because the length of the tubular portion of this often includes taxonomically useful information, and while the "calyx tube" measurement is lost when the fruit are developed, the length of the tubular portion of the free calyx limb is usually still evident on the fruit thus facilitating identification. Another portion of the gynoecium that has been regarded differently by different authors is the distinction between the stigma and style: the structures regarded as 2-lobed stigmas by some authors are regarded as a style with 2 separate stigmas by as many other authors. Morphological study of the androecium and gynoecium here during preparation of a flora treatment has not been detailed and no focused effort has been made here to systematize these morphological interpretations. Inflorescence terminology is complicated in most flowering plant families. The terms "bract" and "bracteole" have been carefully and regularly applied by some Rubiaceae authors, with the term "bracteole" used only for the bracts that immediately subtend the flowers or in some cases that are found anywhere along the pedicels, and the term "bract" used for the remaining structures. However, other authors have not distinguished these structures, or have not distinguished them regularly or consistently. The term "floral bract" here refers to the structures found on the pedicels or that immediately subtend sessile flowers. Bracts and leaves are generally considered homologous structures, and in Rubiaceae these often vary continuously along the inflorescences. 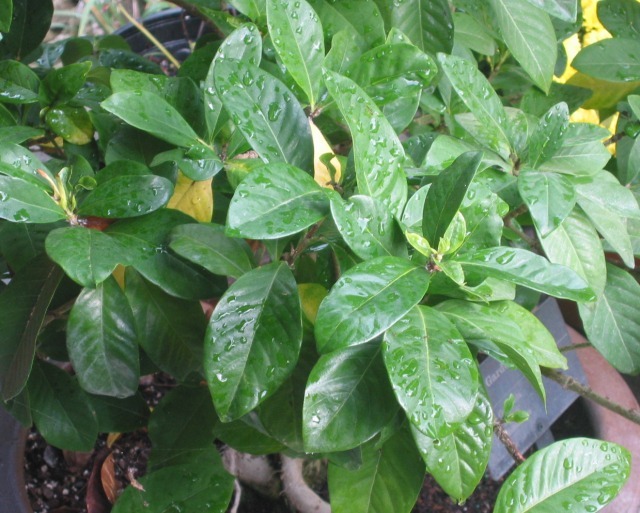 In particular, Rubiaceae commonly have somewhat reduced leaves subtending the inflorescences, and bracts that are somewhat enlarged and occasionally leaflike. These structures have been variously called "reduced leaves" or "foliose bracts" or "foliaceous bracts" (here called "leaflike bracts"). In particular, many species with branched inflorescences sometimes have rather large, leaflike bracts subtending the basalmost pair of secondary axes; these have been various interpreted as enlarged bracts at the top of the peduncle, or vegetative leaves that are borne at the base of a sessile, tripartite inflorescence. Significant measurements found on plants from outside China are noted in the discussions following the species descriptions and/or are included within brackets in the descriptions in accordance with Flora of China style. Authors in FRPS described the seeds and embryos of some Rubiaceae but not others; their descriptions are reported. In many cases no information is available about these features for Chinese Rubiaceae. Authors in FRPS also described the pollen of a few genera; these reports are not included here because a number of very detailed, extensively documented pollen descriptions are available elsewhere, which show that much variation is found in pollen morphology at the species level in Rubiaceae and as yet Rubiaceae genera are not well characterized in terms of pollen. Thus, the very limited information available only at the genus level here does not seem well integrated into this flora treatment. The counts presented here for leaf veins apply to the secondary veins, as done by the majority of Rubiaceae authors. Many species of Rubiaceae also frequently have rather well-developed though shorter intersecondary veins, which often vary widely in number and degree of development between populations or plants; these apparently were occasionally combined with the secondary veins in the measurements given by FRPS, but such measurements are subject to significant misinterpretation by authors working in other regions and the varied usage in that work adds yet more confusion. Where data were missing from the descriptions in the first draft for the Flora of China, the terms "unknown," "not known," "not noted," and "not seen" were retained (with "not known" consisted to "unknown"). Where these terms were used in the habitats and elevational ranges they were deleted in accordance with the style of previous Flora of China volumes. Where missing data were denoted with question marks, e.g., "shape? ?," or with constructions such as "__ × __ ," these were deleted because it was not apparent which of the above categories of missing data applied. The genus Khasiaclunea Ridsdale (Blumea 24: 347. 1979) is known with certainty from India and Myanmar and provisionally from N Vietnam; this may also be present in China, but no confidently determined specimens have yet been seen. The single species, K. oligocephala (Haviland) Ridsdale (Blumea 24: 347. 1979; Adina oligocephala Haviland, J. Linn. Soc., Bot. 33: 46. 1897), was reported by Ridsdale (loc. cit.) as "probably" found in China; however, this genus is not treated here. Lo Hsienshui, Ko Wancheung, Chen Weichiu, Hsue Hsianghao & Wu Hen. 1999. Rubiaceae (1). In: Chen Weichiu, ed., Fl. Reipubl. Popularis Sin. 71(1): i-xvii, 1-432; Lo Hsienshui, Ko Wancheung, Chen Weichiu & Ruan Yunzhen. 1999. Rubiaceae: Rubioideae. In: Chen Weichiu, ed., Fl. Reipubl. Popularis Sin. 71(2): i-xvi, 1-377; Wan Wenhao. 2000. Theligonaceae. In: Chen Chia-jui, ed., Fl. Reipubl. Popularis Sin. 52(2): 147-151. About 660 genera and 11,150 species: cosmopolitan family, with most genera and species in humid tropical regions; 97 genera (three endemic, ten introduced) and 701 species (352 endemic, 23 introduced, six of unconfirmed occurrence) in China.